Mixed-Bag Hunters! We have limited space left for May-Aug, 2019, but peak dates are available. 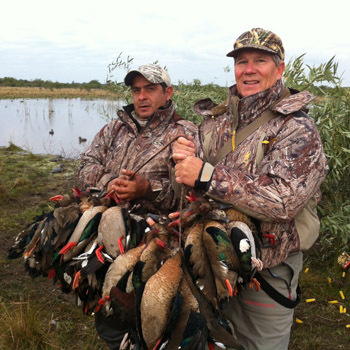 Our Argentina mixed bag hunts offer quality hunting and convenience. Regardless of which combination of duck, dove, Perdiz or pigeon you choose, each hunt is superlative and easily accessible from our hunting lodge. 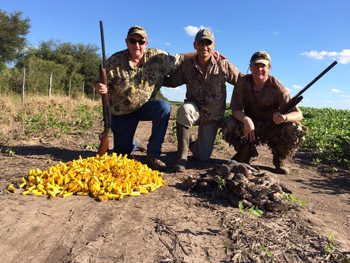 While other outfitters are transporting their hunters 5 or more hours in a van between their dove hunting location and their duck hunting location, we combine Argentina dove and duck hunting in the same day. We frequently get groups that book only ducks, or only dove. However, with such a variety of incredible hunting at our fingertips, most of our guests book with us to experience quality mixed bag hunting in Argentina. Typically they spend the majority of their time on the hunts they are most passionate about, but also get a taste of our other hunts as well. 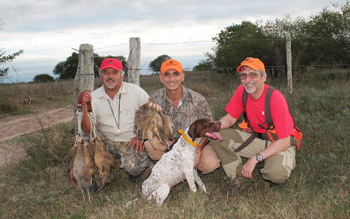 A good mixed bag hunt is a 6-7 days, comprised mostly of Argentina dove, duck and perdiz hunting. A 6-7 day hunt allows hunters to get 3-4 full days hunting their preferred species and then 2 days for pigeon hunting or Dorado fishing. Hunters should always plan for one extra day to allow for bad weather or even a ½ day of rest. Moreover, the longer you stay, the more economical your trip is. Considering the travel involved getting to Argentina, it makes sense to experience as much as possible if you can do it all from one, easy to get to location. Our mixed bag season is May 1-Aug 31. If your priorities included Dorado fishing, we encourage you to come in early May.